This is a short and (hopefully) sweet tutorial, but it introduces an important concept - rule concatenation. Addue rules and rulesets are pretty powerful when used as presented so far, but their usefulness is even further extended by using them in combination with eachother. (where 246 will be replaced in your case by your unique account ID on Addue). 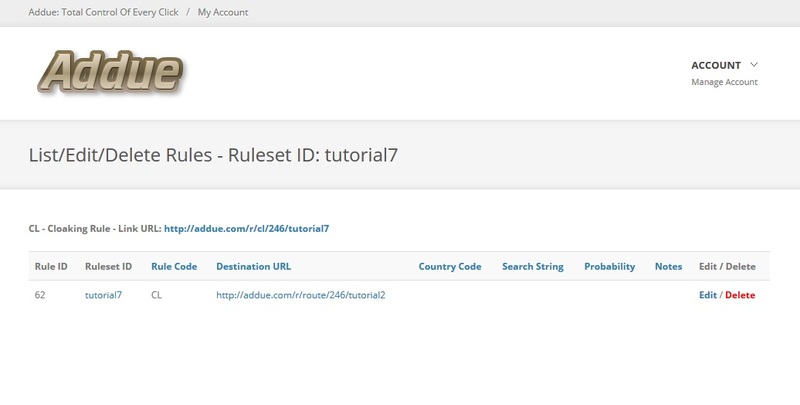 Hopefully you still have the rules set up in that tutorial ready to go, so that your Addue link will be working correctly; if not we suggest you set them up again now so you can follow along. Notice that we've inserted the country routing Addue link as the destination URL of the cloaking rule. Replace 246 with the unique account ID from your link there. As you can imagine, the traffic is first cloaked by the cloaking link, which then hands it off the country routing link according to its destination URL. The country routing link then performs its own usual function of routing according to where the traffic is coming from. This is a simple but powerful concept since you can extend it arbitrarily to achieve any function you want by concatenating rules as required to get the desired outcome. In the next tutorial, for example, we'll see how you can concatenate conversion traffic links with traffic splitting ones to do A/B optimization. Concatenating rules does take a bit of planning, and a pencil+paper might be helpful tools to sketch out the flow in your mind before putting rules into Addue. As you noticed in this example, we cloaked the traffic first, then applied country routing, not the other way round. If we had done the country routing first, we'd then have to set up a separate cloaking link for each separate destination URL in the country routing ruleset. So instead of needing 1 cloaking rule and 1 country routing ruleset, we'd need 1 country routing ruleset and 3 cloaking rules, one for each of our three possible landing pages. This would obviously be a less efficient and more confusing way to do things. In general, the less rules to accomplish the same task, the better! 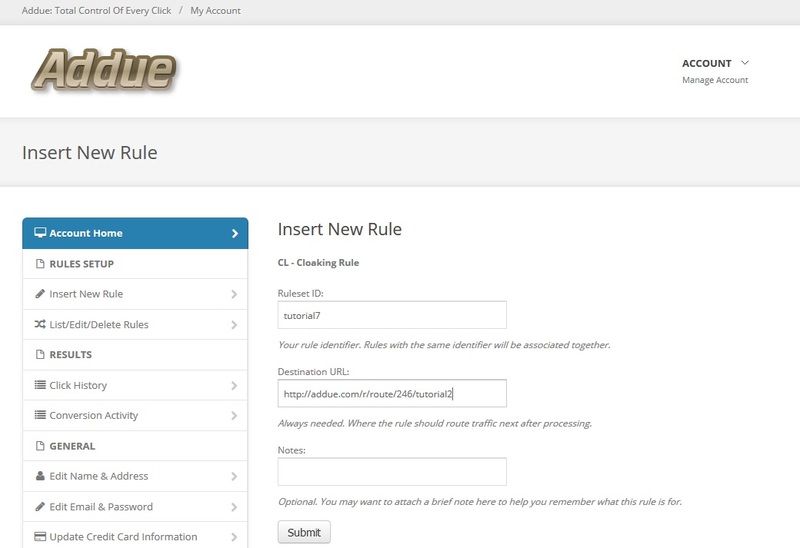 One important note: Addue bills each rule processed in your concatenation chain as a click for billing purposes. In other words, if a visitor is routed through a chain of say, 3 rules, before being redirected out to your target website, this will count as 3 clicks for billing purposes. This charging structure is necessary because it costs Addue 3x the server load in this case to process such a visitor vs. a visitor passing through a single depth rule. We hope you'll agree that Addue's per click charges are sufficiently low that this isn't much of a concern, although you certainly want to keep the length of your rule processing chain to the minimum necessary. As always, if you have any questions about rule concatenations, please feel free to contact us anytime.